Sometimes forget why I do this, why I try and win, why I ended up like this anyway. Sometimes I think I look fine the way I am, this is all I know, this is how people know me and why would I want to change it? Other times I can’t stand the sight of myself because I look so alien and don’t understand why anyone would do this to themselves. 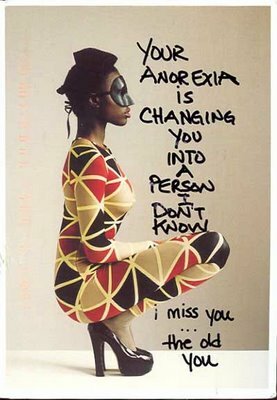 I used to think anorexia was a disease I wouldn’t mind having because at least you were skinny. I didn’t really understand how stupid that was. I’m not skinny, i’m skeletal. I’m tired and ill and no fun because I have no energy to do anything, I’m filled with self loathing and have spent months in agony from the pain of hunger I inflicted on myself. Skinny isn’t best, skinny is worst because it consumes you. I am not my disease, but I’m not me because my disease controls me. I’m in a no mans land. I used to tell myself I’m not as bad as some other people who are in clinics, but now I’ve come to the point when I can’t keep using that excuse to cover up the fact that this is my self-harm. I can’t pretend I don’t need help because I’m not as bad as them. I’m effectively killing myself and although I don’t want to die I’m not trying to live. I’m not living – I’m surviving.